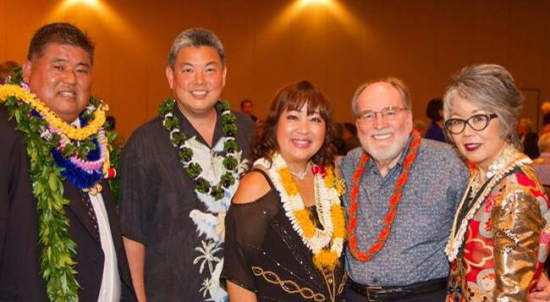 Pictured at the JCCH Annual Gala on June 21 at the Hilton Hawaiian Village Waikiki Beach Resort are, from left: David Furuya, Rep. Mark Takai, Robyn Furuya, Gov. Neil Abercrombie, and JCCH Executive Director Carole Hayashino. The Furuyas, of KZOO Radio, were among the evening’s honorees. HONOLULU – Gov. Neil Abercrombie on June 23 announced the release of $450,000 in capital improvement grant funds for the Japanese Cultural Center of Hawaii (JCCH). Identified by the State Legislature, these funds will be used for design and construction for health, safety and energy improvements to the Manoa Grand Ballroom and related common areas, along with JCCH’s community and administration buildings. The improvement project involves the replacement of ceiling insulation and retrofitting lighting fixtures with energy-efficient LED lighting in the Manoa Grand Ballroom and its common areas. Main controls of the fire alarm system at the center’s community and administrative buildings will also be upgraded. Incorporated in 1987, JCCH is a 501(c)(3) nonprofit organization that serves as a resource for educating present and future generations in the evolving Japanese American experience in Hawaii. JCCH holds various programs, festivals and exhibitions throughout the year. It has more than 5,000 individual members, 12 employees and hundreds of volunteers.